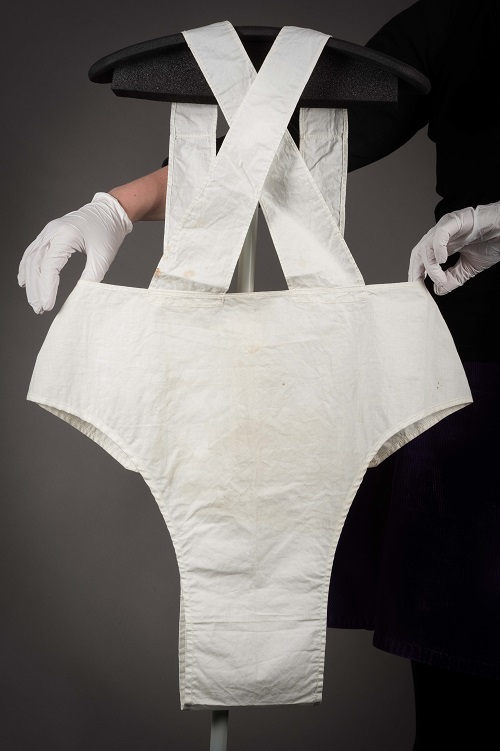 As part of World Menstrual Hygiene Day (28 May), discover the fascinating history of a rare item in our costume collection at York Castle Museum. Collections Facilitator, Dr M Faye Prior, tells us more in this blog entry. Until quite recently it wasn’t considered acceptable to discuss menstruation in public, and in many places it still isn’t. 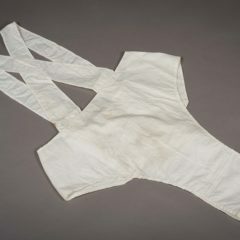 Perhaps because of this, a question left out of many histories of underwear is: how did people deal with periods in the past? 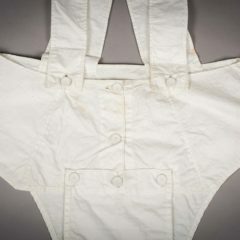 Several months ago, I came across a mystery object in the Costume and Textiles collection of York Castle Museum that might help to answer that question for members of one Northern family in the early twentieth century. 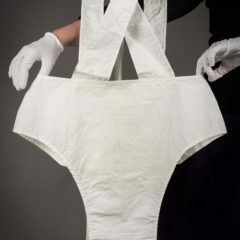 Made of white linen, our mystery object had been catalogued as ‘drawers or a binder’ (a garment intended to support the stomach during pregnancy or restrain the bust), but it looks nothing like any drawers or binder I’ve ever seen. Intrigued, I set out to find out what our mystery garment really was. My first stop was the museum ledgers, the books which record all incoming museum objects. The ledgers couldn’t tell me what the object was, but it did give me a clue. 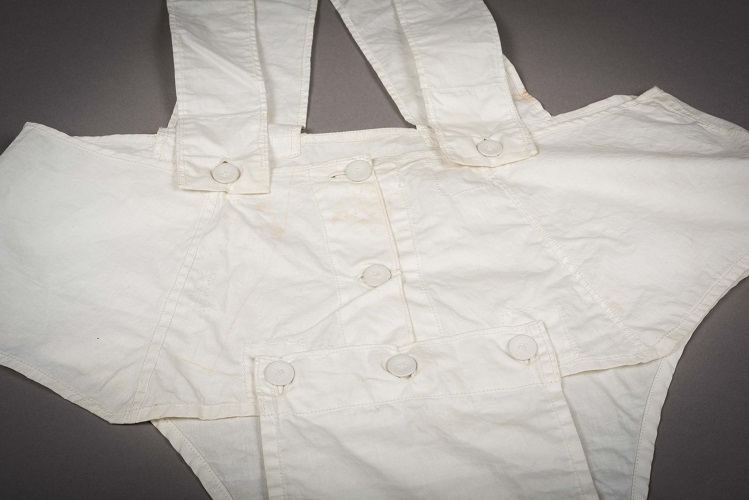 When our object came into the museum in the late 1970s it was described only as ‘Horrockses Longcloth’. This isn’t the name of a garment, so what is it? Horrockses was a department store that had its origins in an eighteenth-century Lancashire textile mill. 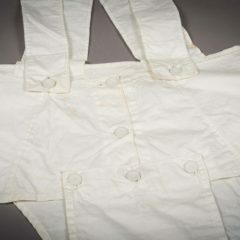 At the turn of the twentieth century it sold ‘Longcloth’, a well-known linen cloth used for home sewing. Our mystery object carries the Horrockses Longcloth stamp, which tells us where the fabric came from; it also tells us that the garment is likely to have been home made. The donor was architect Rachel Rostas, who was born in 1914 and spent much of her childhood in Darlington. 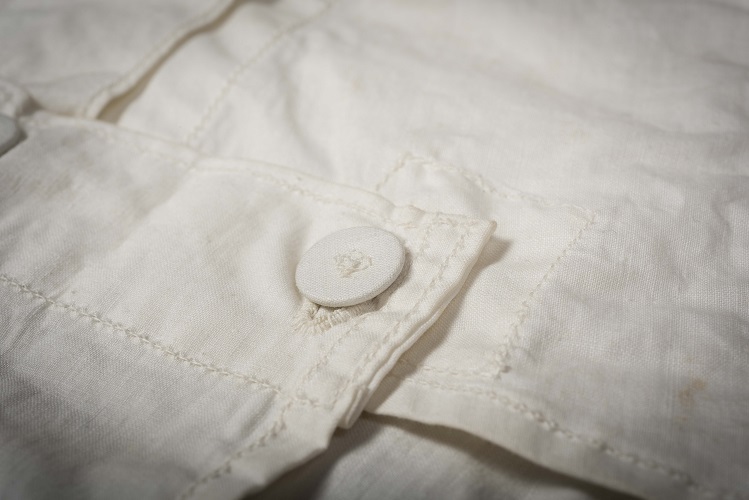 We know from letters Mrs Rostas wrote to the museum that her mother Amy Wallis made many of the family’s clothes. Could she possibly have made our mystery garment? I was struck by how similar it looks to commercial sanitary belts or girdles available at the beginning of the twentieth century, such as this example from the 1912 Coates Sewing and Dressmaking Manual. 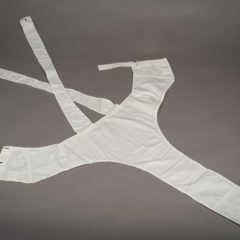 A sanitary girdle is a belt that sits on the waist or hips, with a piece of fabric that goes between the legs (the gusset). 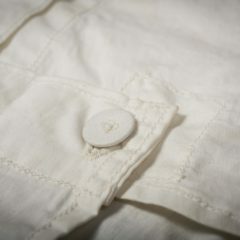 Sanitary pads are pinned, buttoned, clipped or sewn to the gusset. These pads could be made at home from the rags of old clothes, or they could be bought in bulk. Adverts from the time show that commercial pads had fillings such as cotton or sphagnum moss, materials that were also used for bandages during the First World War. These pads were a bit like modern cloth sanitary pads in that they could be washed and re-used. 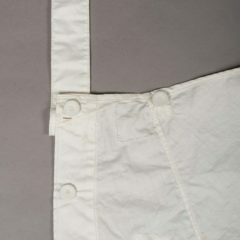 Like commercial sanitary girdles, our mystery object has a fastening at the front, and a very wide gusset. 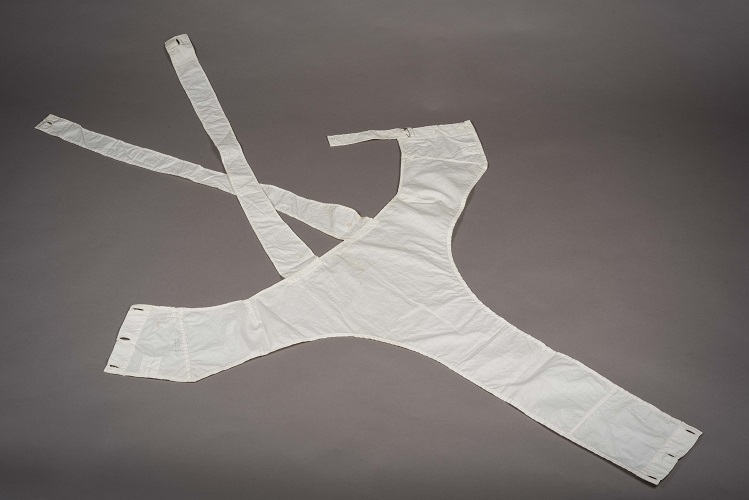 But it also has straps, a feature that I haven’t come across in pictures of commercial girdles. The straps are our remaining mystery, but I have a suggestion. 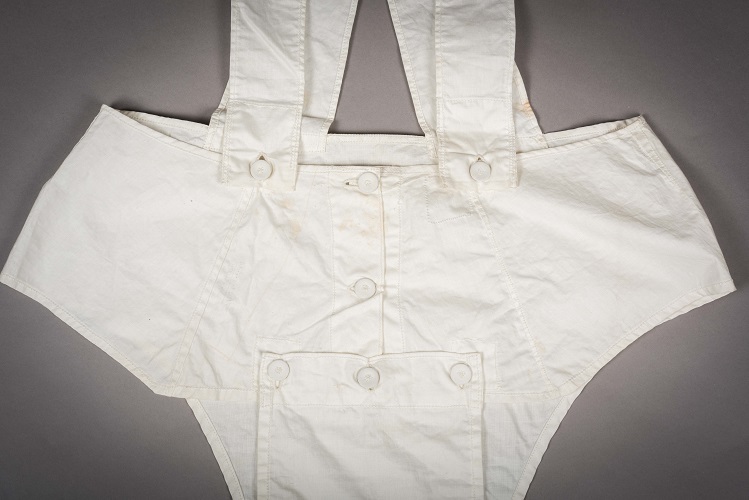 Sanitary belts were awkward to wear and tended to shift around. 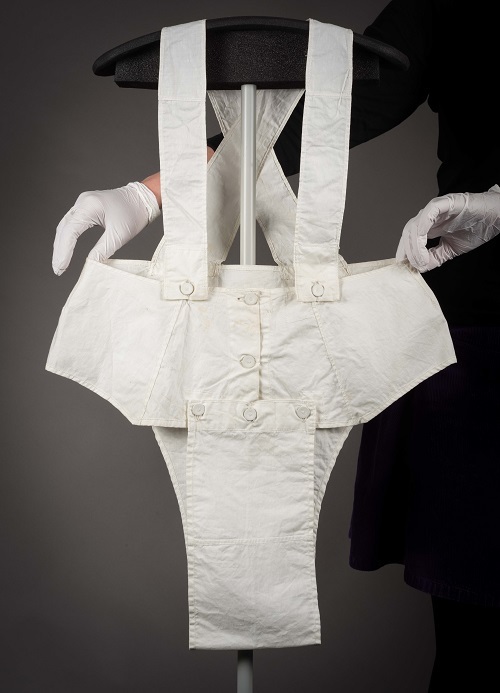 Perhaps the straps on our home-made girdle were added to help keep it in place? 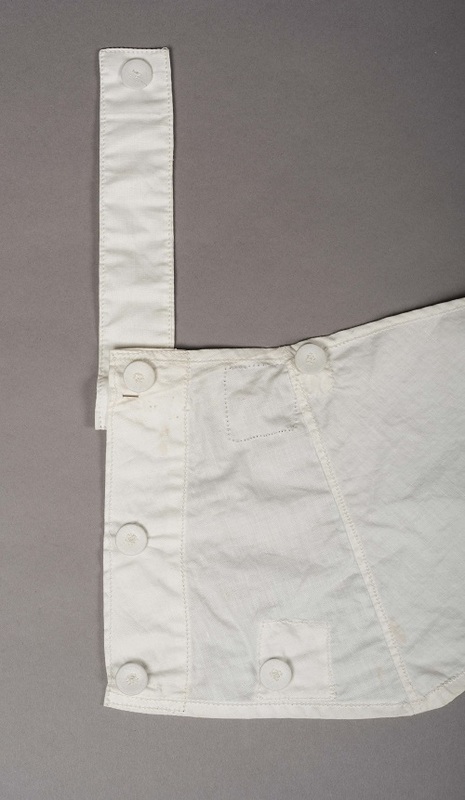 If our girdle was ever used, it carries no blood stains. 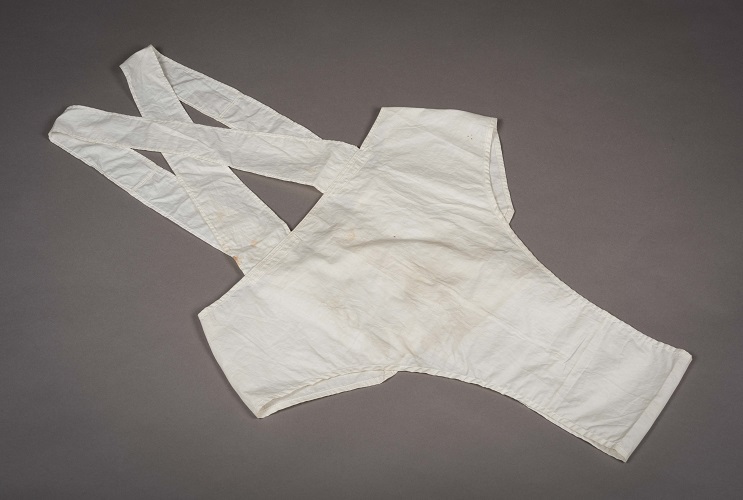 Could it have been a home-sewing experiment to improve on commercial girdles? Could it even have been successful? Or has it survived because it didn’t live up to its maker’s hopes, and was put away and never used? There are still questions to be answered, and some that may never be resolved, but at least we’ve begun to solve the mystery of this interesting and intimate object. Find out more about fashion through the ages in our ongoing major exhibition, Shaping the Body. I am compiling information on methods for handling menstruation for rural women in early 19th century western America (Indiana, specifically), and came across instructions for a sanitary support like this that went over the shoulders in a book from the 1910s. 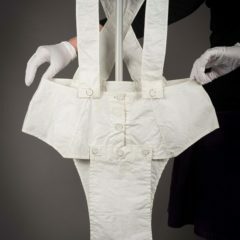 If a person is wearing a corset, having over-the-shoulder supports for the sanitary garment might help keep things in place without adding pressure under boning, etc. I’m interested in hearing more about this piece!